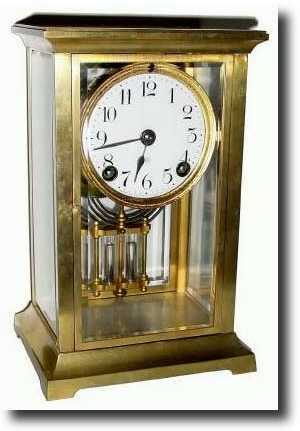 C.1915, Ansonia DORVAL crystal regulator shelf clock in generally good original condition. One of the glass vials has a small chip (hard to see), and there is a faint hairline in the dial (invisible in photo). Otherwise, all 4 panes of beveled glass are good and the clock is running and striking. Height 8.8"